The holy burial chamber is connected to a network of 21 chambers. The chambers are the roofed buildings, of different heights, built during the 1,200 year history of the shrine. The Dar al-Siyada and Dar al-Huffaz were both commissioned by Gawhar Shad. These two chambers provide transition between the tomb chamber and her congregational mosque, situated on the southwest side of the complex. Traditionally, a dar al-huffaz is a building adjacent to a mosque used for the reading and study of the Qur'an. A small element of the Imam Riza Shrine, the Dar al-Huffaz is significant due to its location and its architectural articulation. The Dar al-Huffaz is a tall rectangular room embedded in the main shrine compound and measures 18 meters by 8.65 meters. It is aligned with the Mosque of Gawhar Shah to its southwest and the Tomb Chamber to its northeast. To its northwest is the Dar al-Siyada (Chamber of Nobility), also built by Gawhar Shad, and to its southeast is the Dar al-Salam (Chamber of Peace). Along the northwest wall, the northernmost niche opens into the Dar al-Siyada with an ornate golden door. Across the hall from it another golden door leads to the Dar al-Salam. The remaining niches along the southeast wall contain mausolea of Mashad dignitaries, including that of 'Abbas Mirza (1855-1927), the Crown Prince (na'eb al-saltana) to the second Qajar ruler, and Fath 'Ali, Qajar Shah of Persia between 1797 and 1834. The middle niche of the northwest wall has a door to the Dome of Opak Mirza. 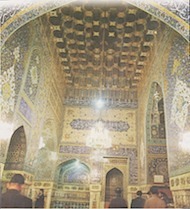 Centered on the northeast wall is the "door facing the Imam" (dar-e pish ruy), leading into the Tomb Chamber of Imam Riza, and on the southwest wall, is recessed a door that opens into the arcade of the Gawhar Shad Mosque. In addition to the finely wrought golden and silver doors, the Dar al-Huffaz is entirely covered with rich decorations. A stone dado incised in relief with inscriptions and floral arabesques covers the walls up to a height of 1.7 meters. Above, in place of the original tile decoration, is elaborate mirrorwork commissioned by the Afsharid ruler Nadir Shah (1736-1747). Chandeliers hang from under each oculus, providing additional light. 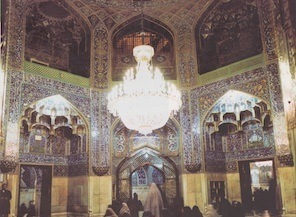 The Shrine is surrounded by different chambers (Riwaq), each of which has a different name. 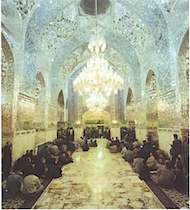 This was inaugurated in 2001 and is one of the largest and nearest chambers to the holy grave of Imam Reza (a.s.). The chamber is located directly underneath the Dar al-Vilayah chamber. This chamber is sited to the west of the Shrine. To its north is the Inqalab courtyard. It is decorated with vaulted structures, with stucco work beautifully painted in different colours. 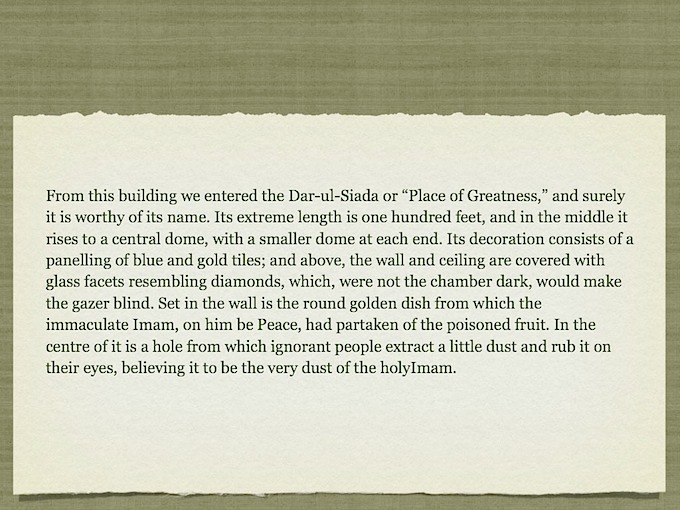 Arthur Pope (1969) says that the domed chamber of Allahvardi Khan is 'contemporary with the Shaikh Luftallah mosque in Isfahan. It is an octagonal structure, with no facade, the interior walls dissolve into arches, bays and galleries, creating the air of a veritable holy of holies... the dome of the sanctuary of Allahvardi Khan is 70 feet high and 36 feet in diameter, filled with a mass of stalactites, crowns the two stories of sumptuously modeled recesses, faced with the finest mosaic faience' (p97-98). Allah Vardi Khan died in 1613 and was described as one of the most powerful viziers of the Safavid dynasty. The foundation epigraphy identifies the builder of the structures as the 'amir al-umara' (commander in chief) of the age, Allah Vardi Khan', and states that it was built during the reign of Shah Abbas. Thus the structures built by Shah Abbas' officials, even their own tombs, named the shah as the primary patron and the supreme authority. There are special oratories in a variety of styles from the faience faced Hall of Hospitality (Dar az-Ziyafeh) with its cascading stalactite vaults, to a nineteenth century mirror encrusted stalactite dome chamber, the Hall of Mirrors. This is located between the Atiq (Inqilab) and Azadi courtyards and is considered to be one of the main passageways to the shrine. It is used as a reception room by the Astana Quds Razavi during Islamic festivals and mourning rites. It is allocated to women for praying and performing religious services. Before 1964-1965 this had been the Qu'ran house and prior to that it had been the library of Astana Quds Razavi. It is linked to the Bala Sar mosque from the south. Dar-u-Fayd from the east and Dar-ush-Sharaf from the west. This chamber is reserved for men. This is the smallest of the chambers. There is a mehrab on the south side of this chamber, which is a remnant of a small and beautiful mosque known as the Women's Mosque of Bala Sar, that used to be here for a long time. This was constructed on the tenth anniversary of the 1979 Islamic Revolution and is located on the north western side of the Holy Shrine. It was inaugurated at the same time as the Jumhuri-i-Islami (Islamic Republic) courtyard. This chamber is used by men and women. Bala-Sar Madrasa is embedded within the Imam Riza Shrine Complex, to the northwest of the main shrine. It is bordered by the Parizad Madrasa to the southwest, the Sahn-i Kuhna (old Court) to the northeast, and the Bala-Sar Masjid to its southeast. Its name, literally translated as 'above the head' refers to the head of Abbasid Caliph Harun al-Rashid's tomb, the first structure built on the site in the early ninth century. Although there are no inscriptions or historical records that ascertain the construction date and the patron of the Bala-Sar Madrasa, historians have inferred that it was built by Timurid ruler Shah Rukh Mirza (1405-1447), sometime between 1420 and 1440. It was restored multiple times, including a recorded restoration commissioned by Safavid Shah Sulaiman (1660-1681). Similar in organization to the adjoining Parizad Madrasa, the Bala Sar Madrasa is centered on a square four iwan courtyard with beveled corners. Each iwan is flanked by a vaulted room on either side, accessed through smaller vaulted iwans. Larger rooms, also entered through arched recesses, occupy the madrasa corners. An identical plan is repeated on the second floor, where an arcade with arched balconies gives access to the rooms. The four central iwans are covered by semi-domes, of which the northwest and the southeast iwans are elaborated with plaster muqarnas of the safavid period. Opposite the entrance iwan, at the center of the back wall of the southeast iwan, is a wooden door carved with a pattern of leaves. Although a wall behind it blocks its passageway, it implies that the madrasa was at some point connected to the shrine complex via an annex of the Dar al-Siyada. The northeast and the southwest iwans are also vaulted with semi-domes, with the latter having a small mihrab niche at the center of its back wall. An inscription dated 1680 commemorates the Safavid restoration under Shah Sulaiman I (1666-1694) and although there is no record of its construction date, the madrasa's relationship to the Mosque and chambers commissioned by Timurid Queen Gawhar Shad in the complex, suggest that it was built at the same time or later than those structures, in the early fifteenth century. Similar in its overall composition to the adjacent Bala Sar Madrasa, Parizad Madrasa is centered on a rectangular four iwan courtyard with beveled corners. It is also entered from the bazaar arcade to the northwest which adjoins the madrasa at a slight angle. The vault of the northwest entrance iwan was covered with a plaster muqarnas during the Safavid restoration and is believed to have the original tilework underneath. The southeast iwan, facing the entrance, has a diamond brick pattern infilled with floral tiles, most likely the only original tilework now present. The southwest iwan is in the qibla direction and has a small mihrab centered on its rear wall.